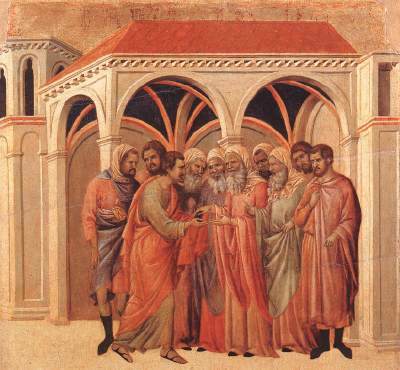 “Having become bold” – What made Joseph, Nicodemus and the Myrhhbearers bold? Synopsis: The Scriptures tell us that Joseph "became bold" and asked for the body of Jesus from Pilate. He did a dangerous thing, which would likely cost him his life, as did the Holy Myrhhbearers when they went to the tomb on the day of the resurrection, to anoint a dead man. Why did they become bold? This is very important! They did not quite " get things right", since Jesus was not dead, so it is not so important that we get everything right and understand everything, but we must &become bold", because of love, and God will cause everything to work to the good. Also, at the beginning, an instruction about praying for people during the most sacred part of the Divine Liturgy, which is an obligation for all Orthodox Christians, and not only the clergy. Mark 15:43-16:8 43 Joseph of Arimathaea, an honourable counsellor, which also waited for the kingdom of God, came, and went in boldly unto Pilate, and craved the body of Jesus. 44 And Pilate marvelled if he were already dead: and calling unto him the centurion, he asked him whether he had been any while dead. 45 And when he knew it of the centurion, he gave the body to Joseph. 46 And he bought fine linen, and took him down, and wrapped him in the linen, and laid him in a sepulchre which was hewn out of a rock, and rolled a stone unto the door of the sepulchre. 47 And Mary Magdalene and Mary the mother of Joses beheld where he was laid. 1 And when the sabbath was past, Mary Magdalene, and Mary the mother of James, and Salome, had bought sweet spices, that they might come and anoint him. 2 And very early in the morning the first day of the week, they came unto the sepulchre at the rising of the sun. 3 And they said among themselves, Who shall roll us away the stone from the door of the sepulchre? 4 And when they looked, they saw that the stone was rolled away: for it was very great. 5 And entering into the sepulchre, they saw a young man sitting on the right side, clothed in a long white garment; and they were affrighted. 6 And he saith unto them, Be not affrighted: Ye seek Jesus of Nazareth, which was crucified: he is risen; he is not here: behold the place where they laid him. 7 But go your way, tell his disciples and Peter that he goeth before you into Galilee: there shall ye see him, as he said unto you. 8 And they went out quickly, and fled from the sepulchre; for they trembled and were amazed: neither said they any thing to any man; for they were afraid. Exegesis of the 3rd Matins Gospel, Mark 16:9-20, and chronology of the day of the resurrection. 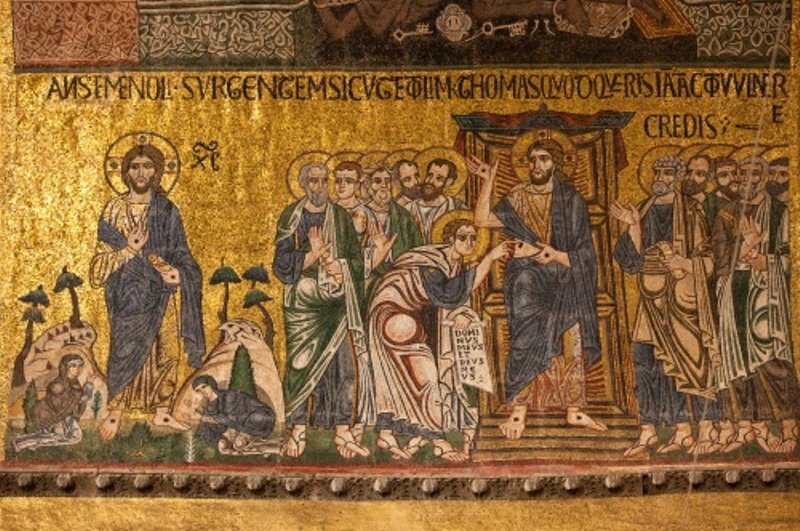 Synopsis: Exegesis of the 3rd Matins Gospel, Mark 16:9-20, and chronology of the day of the resurrection. 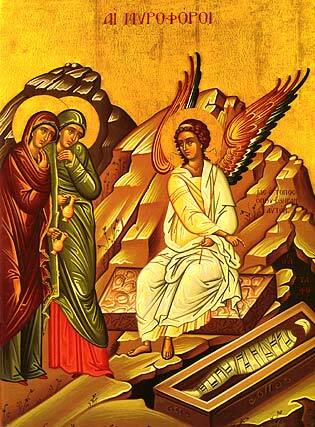 The most important points are the spiritual ones – the resurrection was not witnessed by anyone. What does that mean? A lot! Mark 16:9-20 9 Now when Jesus was risen early the first day of the week, he appeared first to Mary Magdalene, out of whom he had cast seven devils. 10 And she went and told them that had been with him, as they mourned and wept. 11 And they, when they had heard that he was alive, and had been seen of her, believed not. 12 After that he appeared in another form unto two of them, as they walked, and went into the country. 13 And they went and told it unto the residue: neither believed they them. 14 Afterward he appeared unto the eleven as they sat at meat, and upbraided them with their unbelief and hardness of heart, because they believed not them which had seen him after he was risen. 15 And he said unto them, Go ye into all the world, and preach the gospel to every creature. 16 He that believeth and is baptized shall be saved; but he that believeth not shall be damned. 17 And these signs shall follow them that believe; In my name shall they cast out devils; they shall speak with new tongues; 18 They shall take up serpents; and if they drink any deadly thing, it shall not hurt them; they shall lay hands on the sick, and they shall recover. 19 So then after the Lord had spoken unto them, he was received up into heaven, and sat on the right hand of God. 20 And they went forth, and preached every where, the Lord working with them, and confirming the word with signs following. Amen. Is a liberal seminary student as smart as a little girl! No! Children’s sermon on John 5:24-30 and Christology. Synopsis: A children's sermon on John 5:24-30, and important Christology that 7, 5 and 4 years olds know and liberal seminary students do not! John 5:24-30 24 Verily, verily, I say unto you, He that heareth my word, and believeth on him that sent me, hath everlasting life, and shall not come into condemnation; but is passed from death unto life. 25 Verily, verily, I say unto you, The hour is coming, and now is, when the dead shall hear the voice of the Son of God: and they that hear shall live. 26 For as the Father hath life in himself; so hath he given to the Son to have life in himself; 27 And hath given him authority to execute judgment also, because he is the Son of man. 28 Marvel not at this: for the hour is coming, in the which all that are in the graves shall hear his voice, 29 And shall come forth; they that have done good, unto the resurrection of life; and they that have done evil, unto the resurrection of damnation. 30 I can of mine own self do nothing: as I hear, I judge: and my judgment is just; because I seek not mine own will, but the will of the Father which hath sent me. Why are the altar doors open on Pascha? When are they closed and what does it mean? 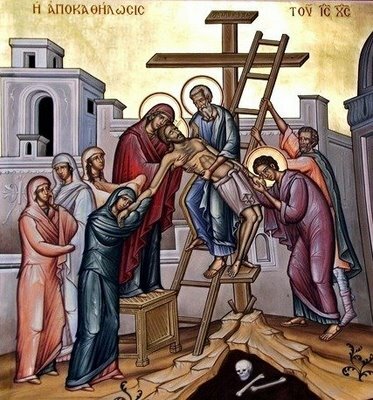 Why are the altar doors open on Pascha? When are they closed and what does it mean? As you can see, the doors are now closed. 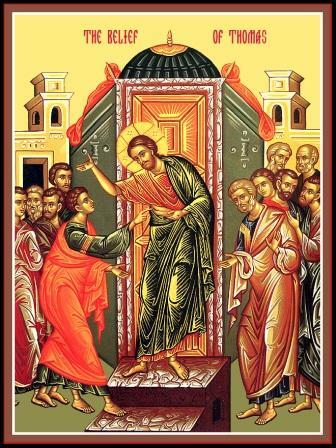 The doors were open for all of Bright Week, from the time of Pascha, all the way until we sang the first Sticheron of Great Vespers for St. Thomas Sunday. It happens to be in the first tone. It's from the Octoechos, so we would sing this every eight weeks we would sing this. We sang "When the doors were shut," and then we shut the doors. Father Nicholas and I were a little bit tardy. It actually was on the next one that we shut them, but the meaning is still the same. "When the doors were shut and the disciples were gathered together, Thou didst suddenly enter in, O our almighty Jesus our God, and standing in their midst and granting them peace Thou didst fill them with the Holy Spirit and didst command them to wait and in no wise to depart from Jerusalem until they were invested with power from on high. Wherefore we cry out to Thee, O our Enlightenment, Resurrection and Peace, glory be to Thee." There's actually two different usages, the one that I had learned before was to shut the royal doors before Vespers begins on Saturday night. But Vladyka Peter told me about what they do, and I find it to be very meaningful, that when we say "when the doors were shut" then we shut them at Vespers. And since Vespers is a transition from the previous day to the next, it's appropriate at that time. Now what does it mean for the doors to be shut? Well, what does it mean for them to be open? Normally they're shut. Why were they open for Pascha? They are open because it is a sign of God's grace overflowing and filling us. Really, all things are made new on Pascha, and God's grace is apparent to all. Now, there's an unfortunate fact of our human nature, and that is, if we are not careful, if we stop struggle for a period of time, we become lazy and we become forgetful and we can fall into despondency and all manner of sins. It's not because God will not help us if we do not struggle. It is because our nature is such that we need to struggle. It's just human nature. When you stop struggle, you go backwards, not forwards. So the doors are open for all of Pascha. We don't fast for all of the Paschal Bright Week. And then the doors are closed. And we return to normal fasting as of tomorrow or the next day, really, Monday, because then we will have normal fasting rules from then on. So Wednesdays and Fridays we won't eat meat and cheese and eggs, except we will be able to have wine and oil throughout all of Pascha. This still shows something of the Paschal joy. All of these things are not just minutia of rules, but they are all things that should remind us about ourselves and about God. When the doors are open, we feel the Paschal joy. When they are closed, we realize this is because of us, because we get lazy and because without struggle we will fall away from God. And also it means another thing, another tragic thing. But this tragedy can be rectified. It is rectified by the Resurrection of the God-Man Jesus Christ. And that tragedy is that we cannot receive all of the Grace of God that He wishes to give us. We're too weak for it. It is as if we have weak eyes and we go out into the sun and we must close our eyes or shield them because it is too bright. The Grace of God is too bright, too holy for us because we are not holy. But over time we become capable of having all of the Grace of God that He wishes to give us and containing it in ourselves. But now we are not ready. So the doors are closed. It's always kind of a sad time for me but a very instructive time. I'm not ready for all of the Grace of God that He wants to give me. Neither are you. But we will become ready if we struggle, if we pray to God, if we fast at the appointed times and pray at the appointed times. Not because there are ten rules that we need to follow or ten thousand, but because of our desire for knowing God. Then, yes, we will become perfected, and the doors will always be open in the Kingdom. The blessing of the Lord be upon you through His grace and love for mankind always now and ever and unto the ages of ages. Amen. This Paschal Troparion is one of the most popular posts on the blog, with good reason! I hate organs, but I could definitely enjoy the percussion, at least on Pascha! "The wonderfully animated priest is my friend and mentor, Fr. Joseph Kwami Labi; with him is Presbytera Gertrude,﻿ and they are at a beautiful church in Tema, Ghana….on the sea coast". And now for something completely different, and also compelling (http://youtu.be/PVYIstvJszw). This is a poem (see below) by St. Vladika Nikolaj Velomirovich. Synopsis: Some Bright week "Do's and Don'ts" that are very important to keep the Paschal joys all week. Here are a few: Do eat a steak and any food you want, every day of the week, and do not eat any tofu, but do not eat too much. Do Read the Gospel of John and the Acts, but do not read the Psalms (I explain why). Do plan on communing on Thomas Sunday, the most important Sunday of the year! Do day the Paschal hours instead of your usual prayers, and do not go back to the world too soon. Towards the end, some heartfelt thank you's for all those who helped with flowers, cleanup, preparation and our choir, which was other-worldly beautiful on Pascha night. Short Video of Pascha Eve, including my scratchy voice, wardrobe changes, and Christ is risen in many languages, including Kikuyu! "Impious Judas with avaricious thoughts plots against the Master, / and ponders how he will betray Him. /He falls away from the light and accepts the darkness; / he agrees upon the payment and sells Him that is above all price; / and as the reward for his actions, in his misery / he receives a hangman's noose and death in agony. / O Christ our God, deliver us from such a fate as his, // and grant remission of sins to those who celebrate with love Thy most pure Passion." 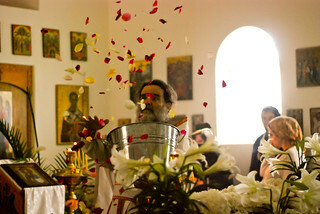 You are currently browsing the Saint Nicholas Orthodox Church blog archives for April, 2012.